The financial markets have begun 2013 in remarkably similar fashion to how they began 2010, 2011 and 2012. In each of these preceding three years the average market participant became optimistic about global economic growth during the first quarter, leading to weakness in gold relative to the industrial metals. Here we go again. As illustrated by the following chart of the gold/GYX ratio (GYX being a proxy for industrial metals such as copper, zinc, nickel, lead and aluminium), gold declined relative to the industrial metals complex during the early part of each of the last three years. Up until now, 2013 has followed the same pattern. 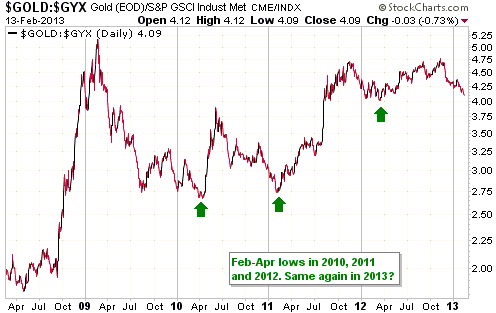 The price action is prompting many analysts to recommend increased exposure to the industrial metals relative to gold, but note that the gold/GYX ratio made its low for the year during February-April of 2010, 2011 and 2012. This suggests that economic optimism was beginning to give way to economic realism by April in each of these prior years. We can't be sure that 2013 will keep following the pattern established during 2010-2012. It's possible, for example, that this time around the central banks have injected enough hallucinogenic in the form of newly-created money to prolong the false economic dawn by a few months, causing gold/GYX to continue its slide into mid-year rather than reversing upward between now and early-April. However, we are reticent to significantly increase our exposure to the industrial metals at this time. Doing so could work for a while, but from our perspective it relies too much on the tenuous assumption that there will be a larger pool of irrational optimists a few months from now than there is today. On a related matter, the markets for gold and the industrial metals are very different. They both benefit from low real interest rates, but in other respects they are diametrically opposite. For example, whereas gold benefits from declining economic confidence and increasing uncertainty, as often indicated by widening credit spreads and a steepening yield curve, the industrial metals benefit from rising economic confidence and greater certainty, as often indicated by contracting credit spreads and a flattening of the yield curve. The major differences between the price drivers of the gold and the industrial metals markets stem from the fact that gold is accumulated as a store of value whereas the industrial metals are consumed. We acknowledge that some gold gets consumed in commercial processes each year, but the amount is far too small relative to the aboveground gold stock to affect the price. The aboveground gold stock comprises most of the gold ever mined, the bulk of which is held as either a form of savings by the private sector or a monetary reserve by the public sector, whereas almost all of the iron, lead and other industrial metals produced during a year have always been consumed during that year. Hardly anyone saves for a rainy day by accumulating/holding iron, lead or zinc, but hundreds of millions (perhaps even billions) of people save by accumulating/holding gold. The differences between gold and the industrial metals outlined above go part of the way to explaining why China and its dramatic economic swings have had a substantial effect on the prices of industrial metals over the past ten years and will probably continue to do so over the next few years, and why China has not had much effect on the gold price over the past ten years and is unlikely to have much effect over the next few years. China's effect, or lack thereof, on the gold market is a big enough topic to warrant a separate discussion, so we'll deal with it in another commentary within the next two weeks. Suffice to say right now that we've read many articles over the past year citing China's gold demand as a major bullish influence on the gold price and that every one of these articles has contained basic misunderstandings about how the gold price is formed. The above-mentioned differences between gold and the industrial metals also explain why none of the purely industrial metals have been able to exceed the inflation-adjusted price peaks that were in place by early-2008, whereas the panic of 2008 and the economic malaise that followed did not alter the long-term upward trend in gold's inflation-adjusted price. The final point we'll make concerns silver, a metal that is part industrial and part store-of-value. Silver, like gold, went on to make new highs in inflation-adjusted terms after the major financial panic of 2008 and the beginning of the bust phase of the bank (central and commercial)-caused boom-bust cycle. This suggests that silver's store-of-value characteristic is dominant and that it will be more in synch with gold than with the purely industrial metals over the years ahead.